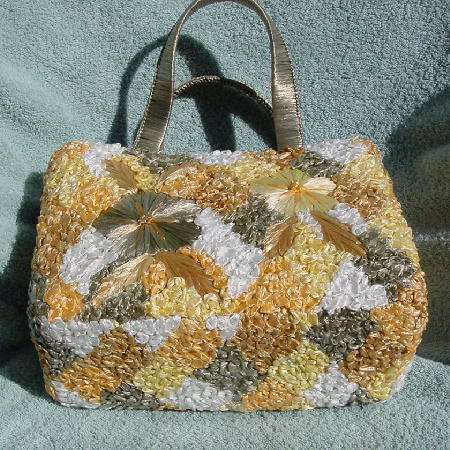 This raffia totally covered (except up to the top) purse has a light cocoa full fabric lining. The interior has a zippered pocket. The lining extends 5" upward with cord pull ties. 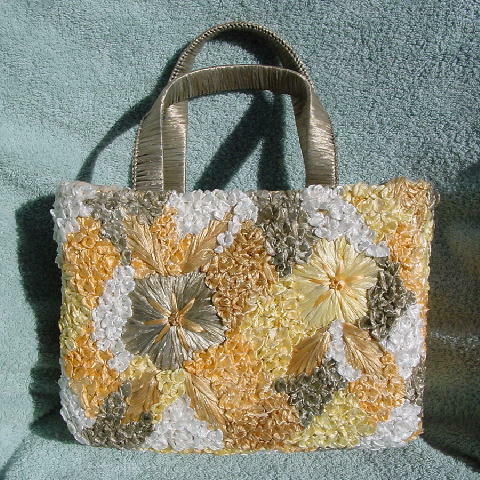 It has two 14 1/2" long raffia wrapped champagne grayed light olive colored handles. The flowers, leaves, and filler designs are in white, light olive, yellow, cantaloupe, and golden maize. It has great detailing and is nicely made. A model got it as a birthday present from her boyfriend. She thought it was too pretty to use. She kept it on her dresser and liked to look at it.